Seattle is a hot spot for people who like to build things. But I’m not talking about computer software or airplanes. Jet City, say hello to Lego City. Hundreds of AFOLs –code name for “adult fans of Lego”– are descending into Exhibition Hall at Seattle Center today for BrickCon, a four-day convention first held in 2002 with just 25 participants. 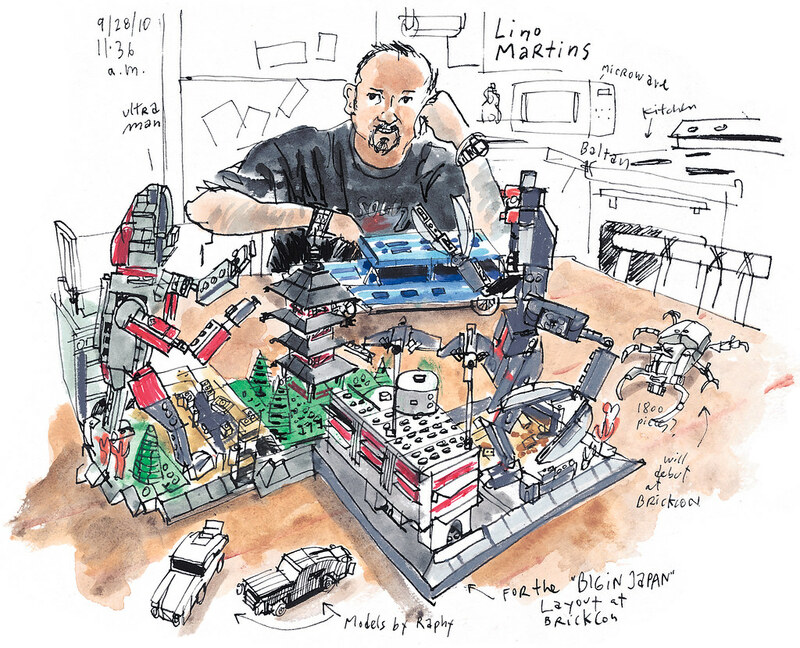 To learn more about the local Lego scene, I visited well-known Lego builder Lino Martins, 39, at his Capitol Hill apartment, where you can’t turn around without seeing a Lego creation. “Some people have a Lego room, I have a Lego apartment,” said Martins, who studied illustration at Massachusetts College of Art and became serious about the artistic possibilities of colored plastic bricks in the past decade. For this year’s BrickCon, Martins has built a 3,200-piece “Ultraman vs. Baltan” display that will be part of a “Big in Japan” theme, as well as other smaller pieces like a “Surprise Mystery Bug” and Lego trophies for the Model Team Motors display (the sketch on the left shows a trophy he won at a previous BrickCon.) He will also bring some car models by r a p h y, a 12-year-old online buddy from Eugene, Oregon, who asked him to display them for him. “I’m very much known as the car guy in the Lego world,” Martins said. His artful and sophisticated recreations of classic and futuristic automobiles have been featured in books and documentaries. Lego even flew him to its headquarters in Billund, Denmark, to join other star AFOLs for a workshop where they brainstormed ideas he’s not allowed to talk about. Martins has gained his reputation sharing images of his work on flickr and participating in Lego online forums like Seattle’s SeaLug and LUGNuts. 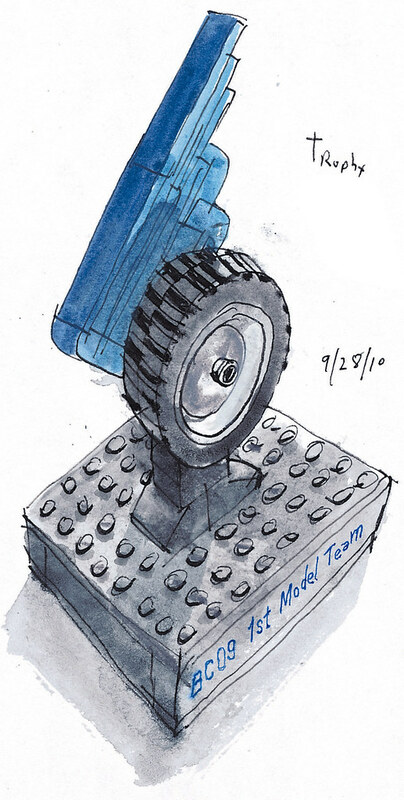 Stay tuned for more sketches of local Lego enthusiasts.